The second day of our trip was to be the start of our longest back-country backpack trip. 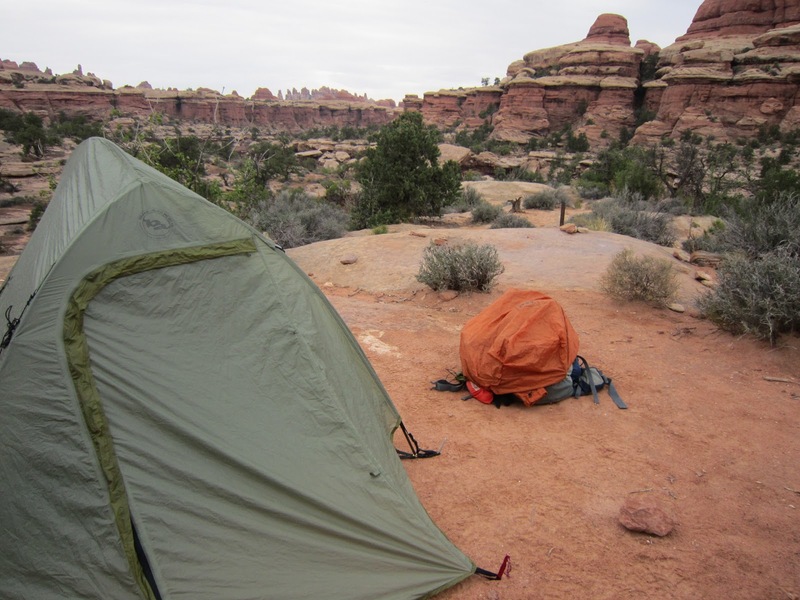 Three days and two nights out in the wild of Canyonlands’ Needles District was the plan. So, we ate our breakfast, packed our gear up and drove to Needles. This brought us through Moab for the first time. With it being early Sunday morning, the town slept on while we found one of the few stores open for a second breakfast. With a muffin or two and some coffee sitting very well in our stomachs, we continued driving south and eventually made it to the park. From our start to the park was about a two hour drive. We stopped at the Needles visitor center to pick up our back-country backpacking permits. There we met with several helpful rangers. This was a wonderful trend that we saw at every place we went: happy, helpful National Park Service Rangers. They were not only delightful people to talk to, but truly helpful as well. Our trip would have been much less successful without them. “We are going to have some flash flooding in the areas where you will be. These trails may be flooded and you’ll have to reroute.” as she pointed to the map we were browsing. We came 2,000 miles and we were going to have our back-country time in the desert come heck or high water (that is how the saying goes, right?). We said goodbye to the rangers and headed off to the starting point for our hike. So, knowing that we wanted at least three days and two nights in the back-country and after looking at the maps, I saw a potential route to take. It is in the pic below. Park the car at Elephant Hill lot. The second day would take us on the green path down to Druid Arch and eventually over to SQ2 camping area (9 miles). The third day we’d evaluate our options as we had to pack in our water for all the days into our packs. We could not count on water being available for us to filter in streams or water holes [later we will have a great laugh about this]. So, if our supplies were running low, we’d walk straight north to the Squaw Flat camp area and get more water. If not, we’d continue east to Peekaboo and then go to Squaw Flat to camp for the night (6 miles). The final day would take us back to our car at Elephant Hill (6 miles). 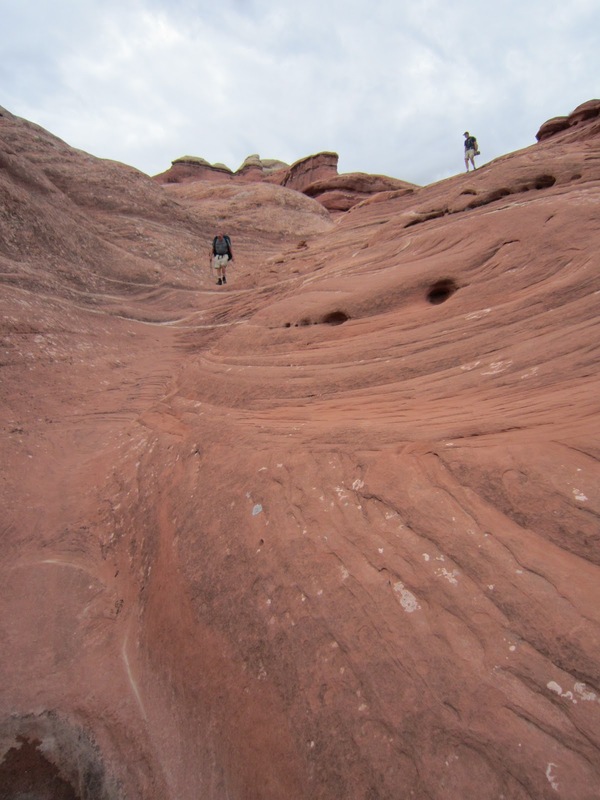 If you are going hiking in a place you have never been, satellite photos and topographic maps do not adequately describe the trails you may be taking. Read reviews, comments, and descriptions of the trails before you go. I wished I had read up on each and every trail in the park. Really read up on them to know and fully understand what all the trails might have in store for us. Turns out the trails I had outlined did not follow the canyon floors with only slight elevation changes as the information I looked at portrayed. When you are in the back-country, understanding what each trail looks like, its difficulty and terrain can be essential to your survival. Closer to the date of the Needles hike I realized that we should probably cut a bunch off of the day one, 12 mile trek as it was our starting day and we didn’t want to kill ourselves. So, I proposed a modified route that would not take us out to Devil’s Kitchen. Our group agreed and so the plan was modified. Let’s recap our day so far. Woke up on the edge of a cliff to a gorgeous sunrise. Ate breakfast. Packed up. Drove to Moab (got a muffin or two). Continued to Needles Visitor Center. Met with Rangers. Drove to Squaw Flat A parking lot where we’d embark. By this time it was mid-morning and we changed into our hiking boots and got our packs really ready for the trail: stuffed the extra water reservoirs in the packs, divvied up common food, applied sunscreen (although later we’d wonder why we did this). And then…we headed out into the wild. Note: If you bring a GPS (Global Positioning System) receiver on a trip like this, set a way point for where you parked your car. Makes the return trip, um, easier. The clouds continued to gather and grow ominous as we walked sometimes on typical sandy soil of the desert and other times on the slick rock of the area. 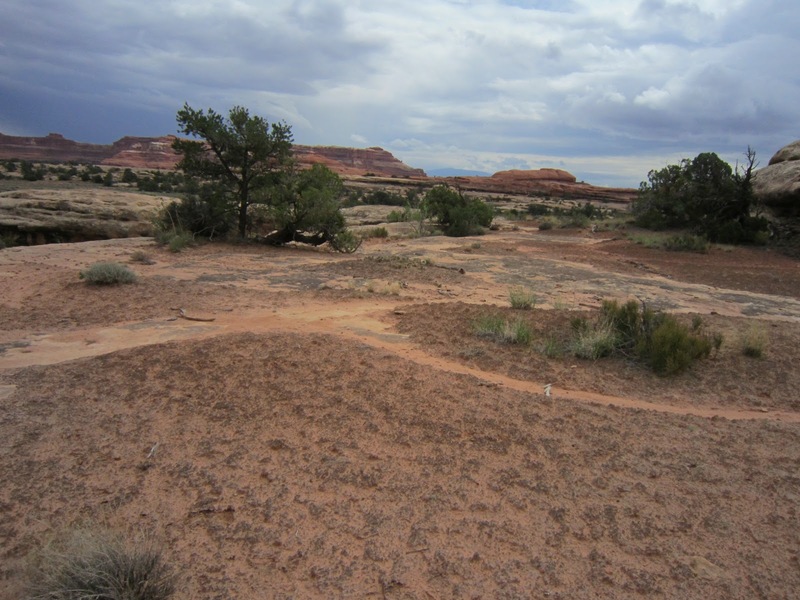 In the picture above, you can see the lighter trail and then the darker cryptobiotic soil in the lower portion of the picture. We were forbidden from walking on the cryptobiotic soil as it is alive, stems erosion, and is extremely important to life out here. We did our best to stay on the trails and slick rock. Our first test came about 0.5 miles later. Well…it truly came about 1.5 miles later when we stopped and I got out my map and GPS. I like doing this while on trail. Seeing if I can locate where on the trail we are and how far we’ve come on the map. So, imagine my surprise when the GPS and map said we were on the wrong trail. Yup. 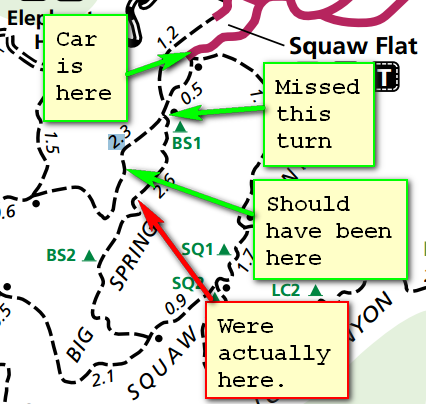 At 0.5 miles into the trek, we should have taken a left at a fork in the trail near BS1 (Big Springs Camp Area 1). We went straight. So, we stayed on Big Springs trail which, if you look at the map, is really no big deal. 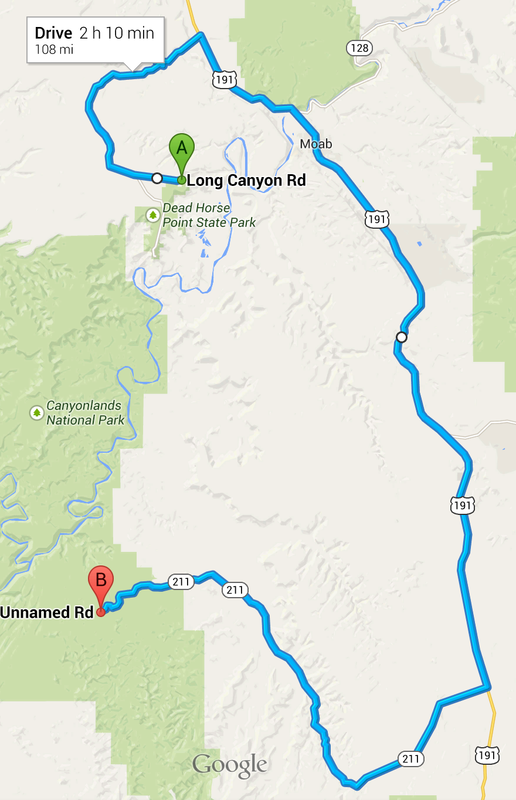 It’ll take us to Squaw Canyon and we take a right and that would get us to our CP5 camp site. We discussed turning back and getting onto the “correct” trail but decided we were half done with Big Springs and it’d take us to CP5 anyway so we’d press on. Note: We still were navigating using the map and what we thought the topographic map showed us. Had we opened our maps a little more and read the trail descriptions in the corner, we may have decided to turn back and try to take our original route. But alas, we did not. Ranger Muse explained some of the other “features” we would be traversing as we continued on the Big Springs Trail: flame spurts, lighting sand and R.O.U.S.s (Princess Bride quote…sorry, I could not resist). She mentioned that we had to scale a large rock hill (picture of us coming down it is on the right). 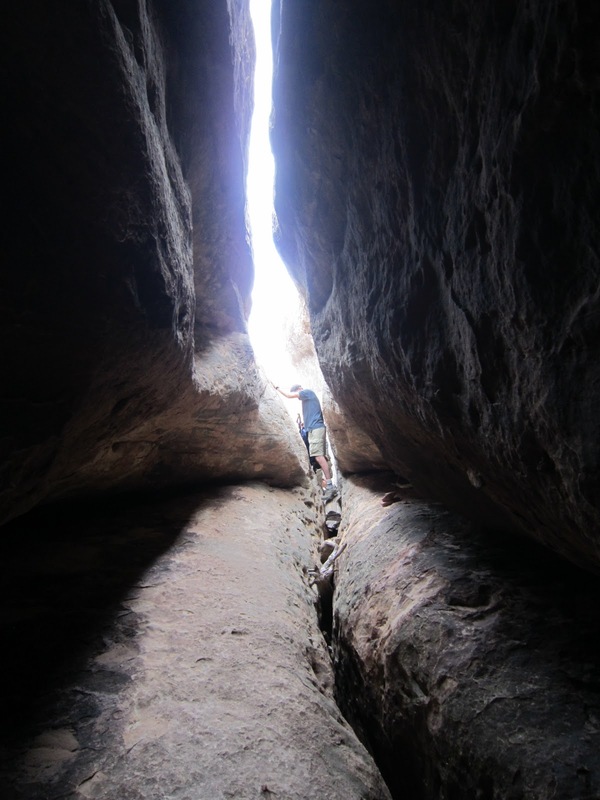 Then we’d have to go through a crack in the rocks. Well, she described it as a crevice. “Yes. It’ll look like the trail comes to a cave and you’ll wonder if you should walk above it. Don’t. Go right through the crack and walk on the juniper logs that we have stuck in the crevice for you to walk on.” she replied. She smiled. 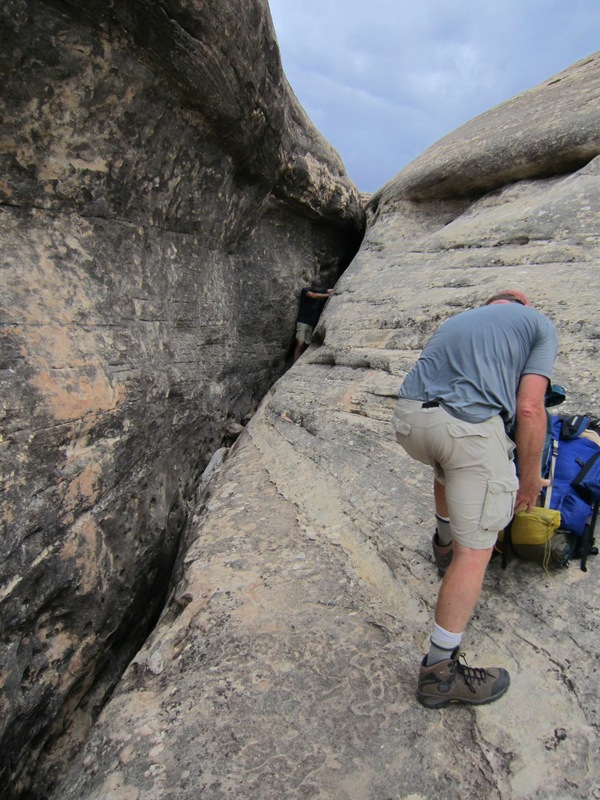 “The logs will hold you although you may need to take your packs off to make it through the narrow crack. Oh, and it you drop anything in the crevice, it is gone. Forever.” Now I don’t know about you, but when someone says something like that to me I immediately think of myself falling into the crack and being irretrievable. Forever. But traverse a crevice we did. If it hadn’t been for Ranger Muse telling us to walk on the juniper logs, no telling what we would have done. And yes, one of our group had a wide external frame backpack that he did need to pass-through since it was too wide to pass. And no, nothing fell into the abyss below. 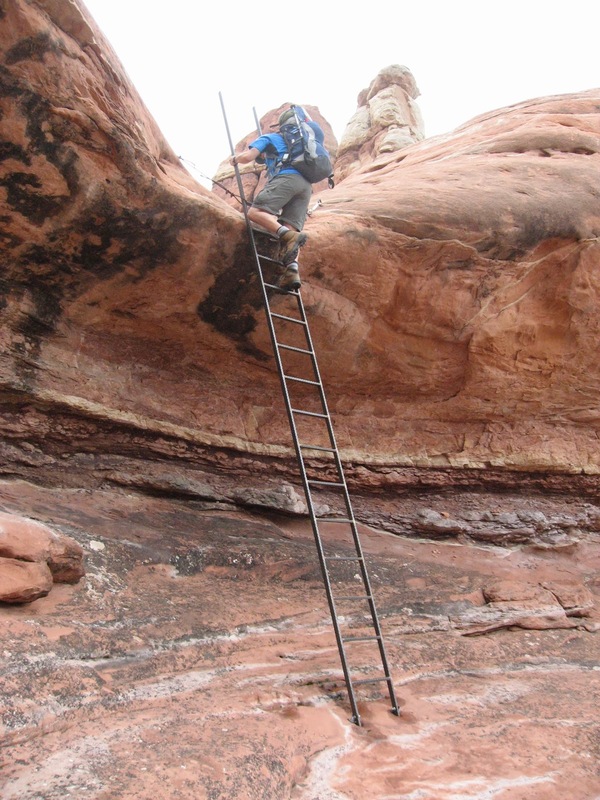 Next she mentioned that we’d have to climb and descend two metal ladders bolted into some steep rock. OK. Bolted ladders we could do. And we did (picture on the right). And then we walked and rested and walked and rested. Eventually, 5pm rolled around. 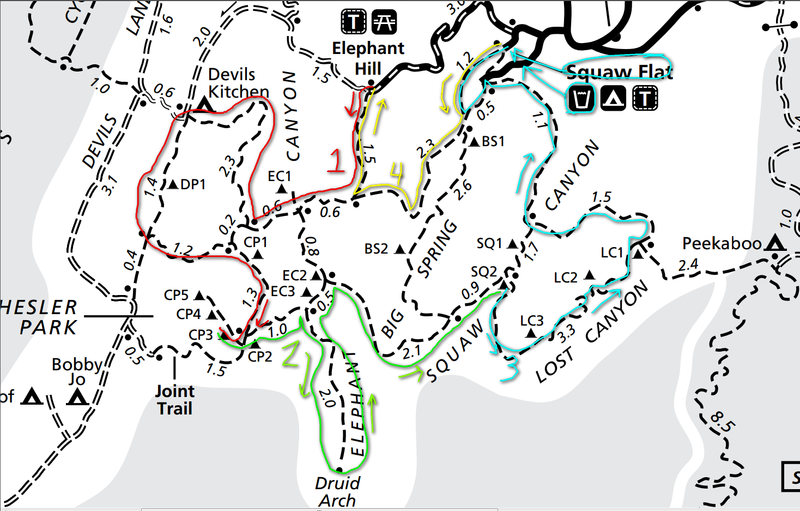 We had expected to be at our camp site eating our dinner around now but, looking at the map and finding we were about half way to the EC3 camp site on Squaw Canyon trail, we decided that we needed to alter the plan once again. Our reservation with the Park Service was for the CP5 site. It was about 2 miles more to get there and, like I said, it was already 5pm and we were tired, wet, and hungry. We made a decision to go to the EC2 camp site (see map at top of this post) and pray that either no one was at it tonight or there would be enough room for us plus whomever had rightfully reserved that spot. And so, with a more positive attitude that food would be coming soon, we hiked on. 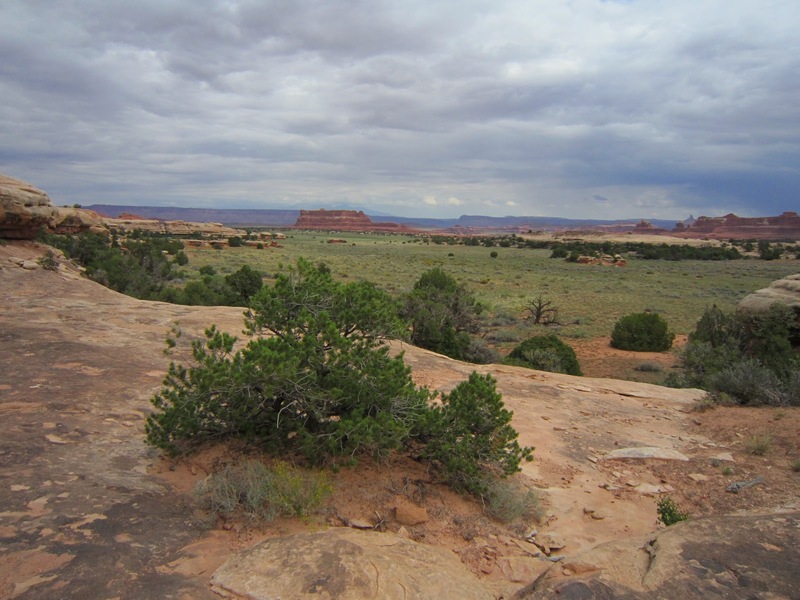 From this higher point in the trail, we soon descended to the dry river beds or washes that filled with rain water when it graced the desert. The Squaw Canyon trail met up with the Elephant Canyon trail and we made it to the EC2 site that rested high on the western side of the canyon wall. This was optimal as we knew rain was coming and definitely wanted to be higher up out of the canyon so that we’d hopefully miss a lot of the running water. On the left is my tent and the view of the needles in the distance from my “front door”. 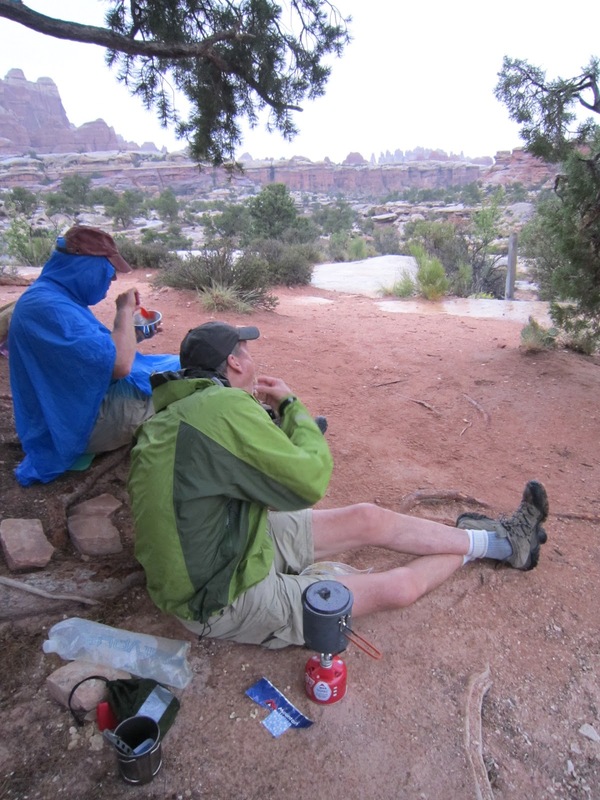 We set up camp and quickly devoured some hot dinner food we had bought at the REI in Grand Junction. With full bellies and wet clothes, we said good night and piled into our tents for the evening knowing that strong rain was on the way and praying that it’d miss us. But that didn’t happen. During the night, the rains came and they brought winds with them. It came loud as a freight train at times and soft as the plink of a droplet of water hitting a still pond at others. And we slept. Then the morning came. Day 3.